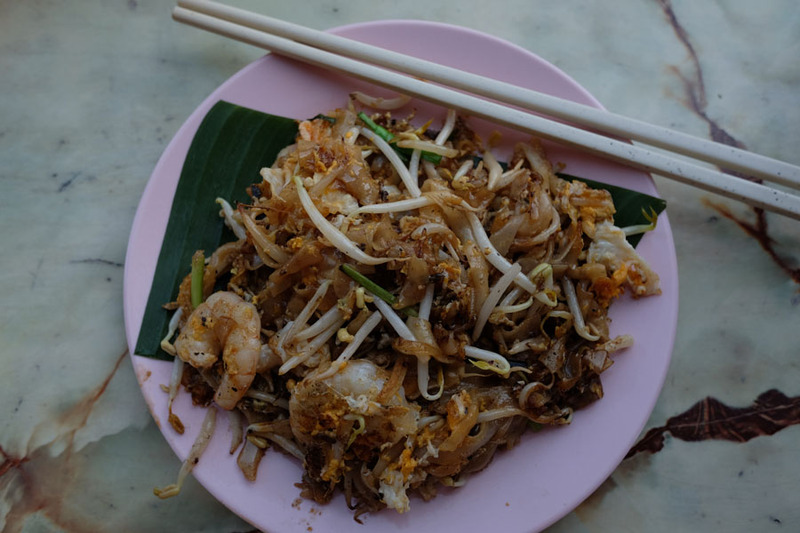 I have an obsession with Char Kway Teow, or CKT for short, whenever I’m in a hawker center that’s the first thing I’d order whether it’s for breakfast, lunch, dinner or even supper. So what is CKT? It’s basically flat rice noodles fried in a wok under high heat to produce the “wok hei” aka smoky aroma. The basic ingredients found in CKT are shrimps, cockles, egg, Chinese sausage, bean sprouts and Chinese chives, along with seasoning such as chili paste, belacan, and both light and dark soy sauce. If the stall uses pork lard and duck egg then you have hit the jackpot! Located just in front of Sin Guat Keong Coffee Shop at the junction of Kimberley and Cintra streets you’ll find this uncle churning CKT like a fast food joint, literally. He prepares the noodles by large batches and put them aside, as the orders come in he will grab a handful and add in the rest of the ingredients then recook them. Which is probably the reason why I find the CKT lack the distinct wok hei and personally I find the noodle’s texture too soft. At Kafe Ping Hooi you will find other dishes being recommended such as Hokkien Noodles and Lor Mee so why not 3 birds with 1 stone eh? The CKT here tasted much better than the uncle’s at Kimberley street. Still, only a passing mark on the report card. The infamous red hat aunty, if you did your research and read the reviews most will comment on her rudeness which resulted in some locals boycotting her business. We arrived during lunch hour thus there was already a long queue ahead of us. Her staff told us before hand the wait will be an hour or more so we camped down sharing a table with a lone patron. The stall uses charcoal with an electric fan to maintain high heat on the wok while the aunty does her cooking at a moderate pace, plate by plate. No batches here. There was a small drama when a customer changed her orders and the aunty wasn’t too happy about it and she let thoughts known. No biggie, I sort of side with the aunty, with dozens of orders to fulfill the last thing she wants is for people to start changing their orders and disrupt the flow and potentially mixup customers orders. We had a blast and our tummies was happy. I do find the CKT in Penang to be on the expensive side, most starts at MYR$5 and if you want bigger portion with added ingredients it will cost upward to MYR$12-14 per plate.